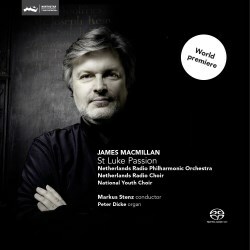 A few technical preliminaries: this is a live recording of the world premiere performance of Macmillan's latest Passion setting. The recording reveals the sort of low-level noise expected at such an event but the audience manage the full 73 minutes without coughing. The volume needs to be set well up for the quietest details to tell but one should be aware that the few loud passages are very loud despite the moderate forces involved. The English words are not as clear as they might be, partly as a result of the level. The booklet does not contain the text; for that interested purchasers should go to the Channel Classics website where they are given. I found the words a vital requirement in following this impressive work because the composer is very sensitive to them. His choices need to be followed closely for the fullest appreciation. The text is set, unusually, entirely for chorus. The words of the Evangelist are sung by the adult chorus, those of Christus by the children's chorus, itself a significant decision which casts light on Macmillan's attitude to the story. Given well over an hour of wall-to-wall choral singing it is fortunate that he is so good at word-setting; in many ways as good as Britten. After the serious and tense opening "Prelude", setting a handful of non-Passion verses from St Luke, the opening chorus of part two, which Macmillan calls, for obvious reasons, "Chapter 22", is gripping and rhythmically vital. It displays his skill to the full. There is something very fluid about his handling of the text throughout. The fact that the choirs in this premiere are both Dutch shows how good those choirs are; there is not a hint that they are singing in, for them, a foreign language. The words of Christus are much calmer than those of the Evangelist. Setting the former for children's voices adds to a sense of peaceful acceptance. This is in stark contrast to the bleak and sometimes angry utterances of the Evangelist. The orchestra, especially the brass and drums, emphasize the drama at every turn. This is quite unlike a Bach Passion in that no time is given over to reflection on the theology or emotional significance of the events. Almost the entire time is devoted to the unfolding story recounted in St Luke, Chapters 22 and 23. This leaves only the music to convey emotion and drama, which it does to superb effect. One particularly impressive large-scale section is the second chorus of "Chapter 23". Two huge organ chords act as parentheses around Pilate's pronouncement that he cannot find any reason to condemn Jesus. The call by the crowd to 'Crucify him!' is given to a massive crescendo starting very quietly indeed and rising to a level that might disturb your neighbours. As interesting as the predictably dramatic moments are, those when Macmillan eschews convention are equally intriguing. For example the rending of the temple veil is quiet, though what follows is not. The coda of "Chapter 23", focused on the words of the centurion that Christ is clearly innocent, contains one of the biggest orchestral passages in the work. The "Postlude" is a mixture of oriental and Gregorian musical styles. It's a very effective combination, as the chorus describes The Ascension, a part of the Gospel story not usually included in a Passion setting. The closing minutes are for orchestra with wordless chorus, a rather striking effect. Macmillan has created a unique and powerful piece that should not be ignored. He explicitly wishes for amateur as well as professional performances and has made the music fairly straightforward to play and sing, and also flexible in terms of the forces used. The booklet, though it lacks the text, has some valuable and informative notes.